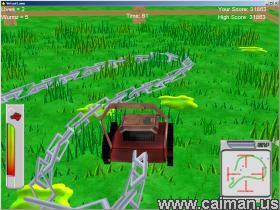 Caiman free games: Virtual Lawn Mower by Amanda P. and Benjy W.. Squish all 30 "wurmz" to continue to the next level. When you squish a "wurm" the chain attached to the rear of your lawn mower will grow by six links. 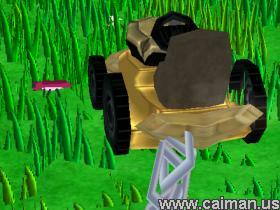 Avoid ramming into the perimeter fence, and running over rocks or the chain. Ramming or running these over will inflict damage to your mower. When the mower has taken terminal damage it will explode and one life will be deducted from you stash. Cutting grass will restore health to your mower. You can choose between 3 different mowers. The many many levels stays for hours of fun. Homepage The Game Creators (DarkBasic) .